Ever wondered who the homeless are? Even though we’ve been moving a bit from pillar to post over the last year or so, because of the earthquakes here in Italy, I am lucky always to be able to write with a view. My desk is an old cupboard door balanced precariously on a tiny fold-up garden table and I look out on landscapes straight from an Italian Renaissance painting. I think I would shrivel up and die without the changing light over the rolling hills and woods. My head is permanently a jumble of thoughts, worries, plans and promises but my desk is not. Spartan is the right word. Few objects: coffee cup, cigarettes, ashtray and the occasional cat. I listen to Muddy Waters if I need inspiration and Bach if I don’t. The Corrections (Jonathan Franzen). Julius Caesar (Mr Shakespeare, Bridge Theatre). Both chart the agonies of a world changing and partly going mad and how that affects and arguably distorts the people who live through such times. One is set 55 years before Christ and the other is 1,600 years after, and yet the themes are as relevant now as they were then. How depressing is that! John Wyndham’s The Midwich Cuckoos. 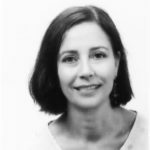 I had a rather disturbed and damaging childhood and was drawn to, and appalled by (in equal measure), the notion that while the world was going so horrifically wrong we would not notice – until it was too late – that the menace was amongst us all along. I was enthralled by the lack of obvious drama that somehow concealed the stark horror hidden under a veil of domestic normalcy. There were two, actually. American Psycho and The Bonfire of the Vanities. You can observe and write about the world that is decaying before your very eyes by simply charting fairly pedestrian events around you. The book I ended up writing became – by virtue of the stories told by the people in it – a comment, a reflection of the kind of society we have allowed ours to become. Laptop. I look more plausible. I feel more plausible. And my pens always leak. And no one knows when I’ve scratched something out. The page always looks perfect. Rarely. Oddly, though, The Corrections was a re-read from fifteen years ago. Tony Soprano. A mesmerising mix of psychopath and pure charmer. I’d have let him babysit my kids. How clever to be able to pen a character that you cannot help but be drawn to – to be attracted to, even – who is fat, wears wife-beater T-shirts, buries people in the ground but cries when the ducks on his swimming pool leave. I can’t remember. My excuse is that I don’t have one here in my village! Ulysses. I’d have to be stoned for several consecutive weeks to make sense of it. Ever wondered who the homeless are? Read Four Feet Under and find out. 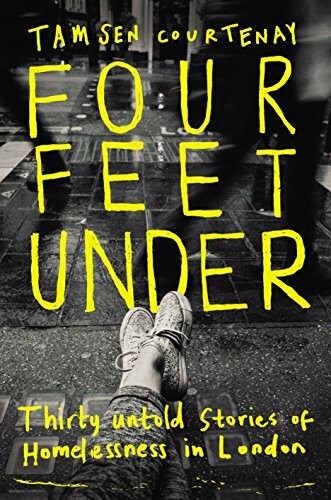 Tamsen Courtenay’s book, Four Feet Under, is published by Unbound. Buy here. Why, in the Britain of 2019, is homelessness on the rise? A writer speaks to those without a home and reflects on universal credit.